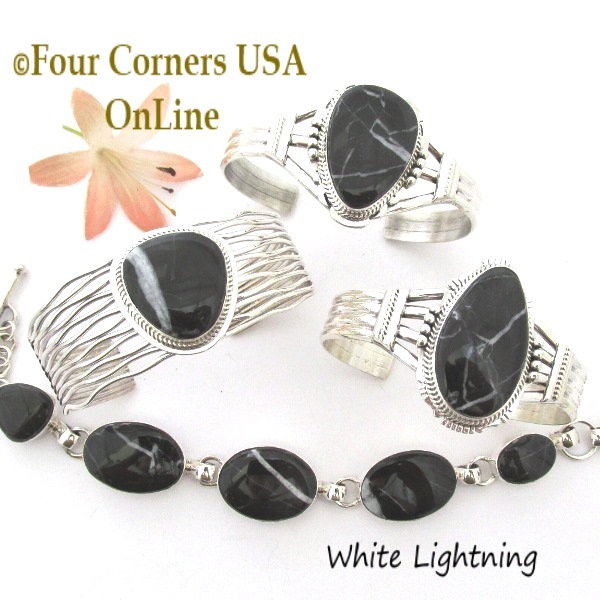 Collection of White Lightning Jewelry by renowned Native American Navajo Artisans such as Phillip Sanchez, John Nelson, Lyle Piaso, Joe Piaso Jr., and Murphy Platero to compliment any Style or Budget. White Lightening Natural Black Marble is the invert of White Buffalo and often looks very similar to natural Black Agate which showcases predominantly black stone with white ribbon inclusion like a Lightning Strike and polishes to a mirror finish. White Lightning as in Lightning Strike not Lightening as it is often misspelled. Marble is one of the oldest architectural and decorative materials as seen in statues and buildings which outlasted the ancient cultures that built them. It has been valued for thousands of years for its rich palette of colors, appearance and array of finishes. As with many natural stones used in jewelry making certain precautions should always be taken to protect the stone/setting. Even though Marble is commonly used for countertops and flooring, it is reactive to the acids found in vinegar, orange juice, and lemons.